After Austin, we spent a few days in DFW. Many of the local campgrounds were closed because of flooding. (The area has received a lot of rain over the last few months and weeks.) 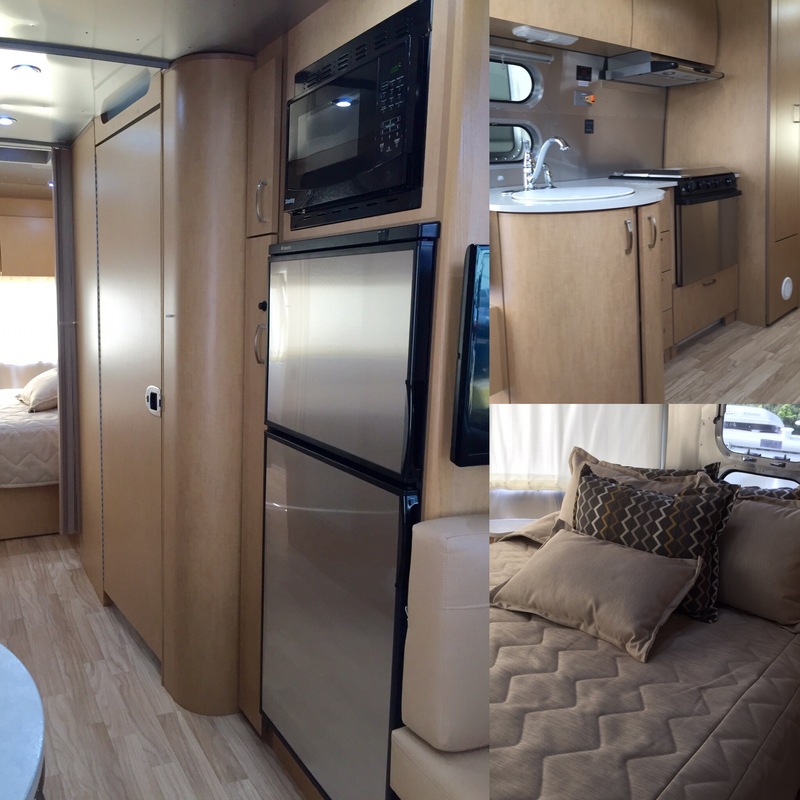 We finally found a good option near Texas Motor Speedway – Northlake Village RV Park. It was great to visit with old friends and I am looking forward to coming through the area again early next year. We had to get back on the road, though, in order to make it home by Christmas. We left on a Saturday and made it to the KOA in Little Rock. 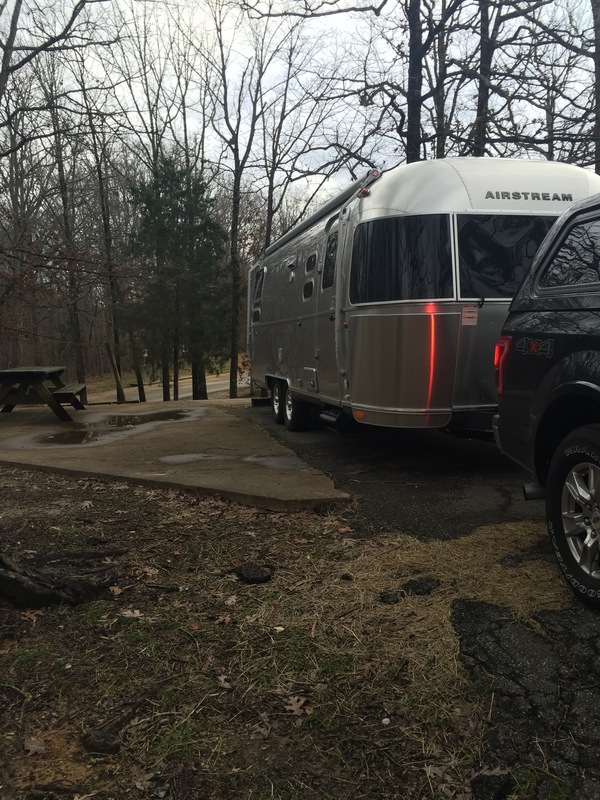 Next stop was Wranglers Campground in Natchez Trace State Park in Tennessee. After a late run, partially on a sandy dirt road and then along the curvy, hilly road to the campground, we survived a very big storm. We’ve been in worse but this was definitely the noisiest night we’ve every spent alone in the woods. Somewhere outside of Nashville, a truck driver tried to kill us. It was rainy but that didn’t stop an 18-wheeler from deciding that we weren’t going fast enough and whipping around us as the highway split off. He came flying up on our left and had to ride the shoulder to get around us. He barely missed the guard rail. We would have been killed except our guardian angels were with us. We couldn’t make the drive home without one night in a Wal-Mart so we stopped in Bristol, VA. It would definitely be cheaper to have paid for a KOA. I’m still working on storage and loaded up the cart with all kinds of options. Our last night on the road was in Mt. 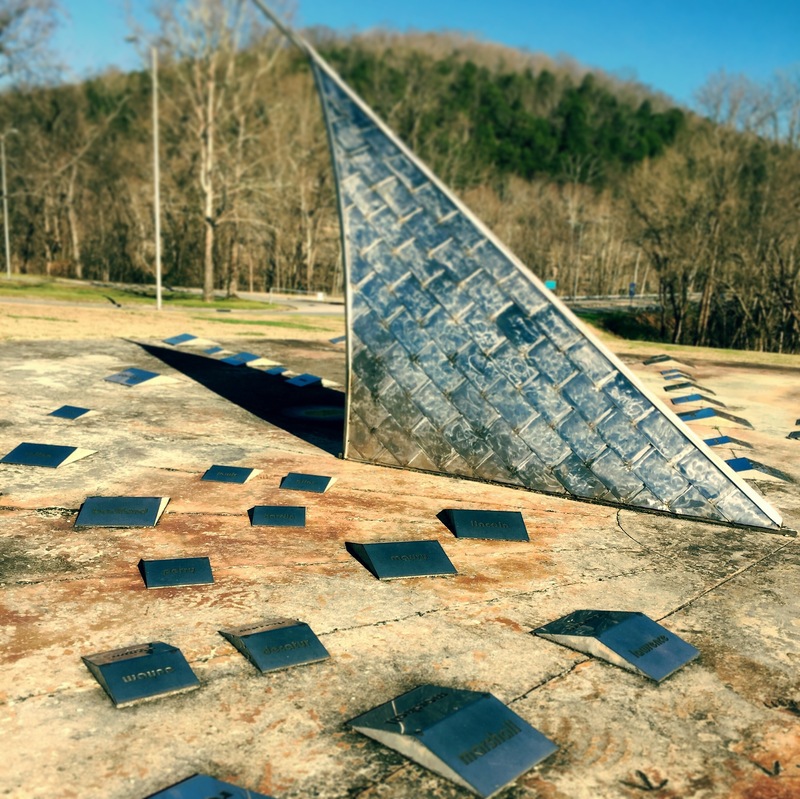 Jackson, VA. I needed to do a run and Shenandoah Caverns Campground looked like a good option. This morning Alan and I headed out to run 5 miles on the local roads. We were watched by cows, goats, dogs, llamas and at least one pig. A young kid did try to kill us on the road by taking a blind corner way too fast. Luckily, one of our guardian angels made sure I heard him coming and we were able to get out of the way in plenty of time! At least five times in the last week, one of us questioned whether we have been some place before and had to go to the blog for verification (including whether or not we had ever stayed in this campground!) I may not write great prose, but this blog definitely serves a purpose. 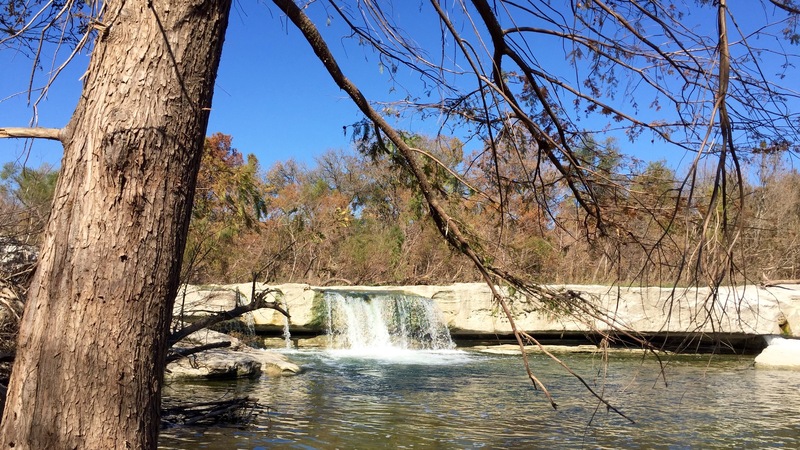 For the record, this is our first documented visit to McKinney Falls State Park. When we’ve been in this area, we typically stayed at Buescher or Bastrop State Park but this time we opted to stay closer to Austin where Brian and Will were camping. 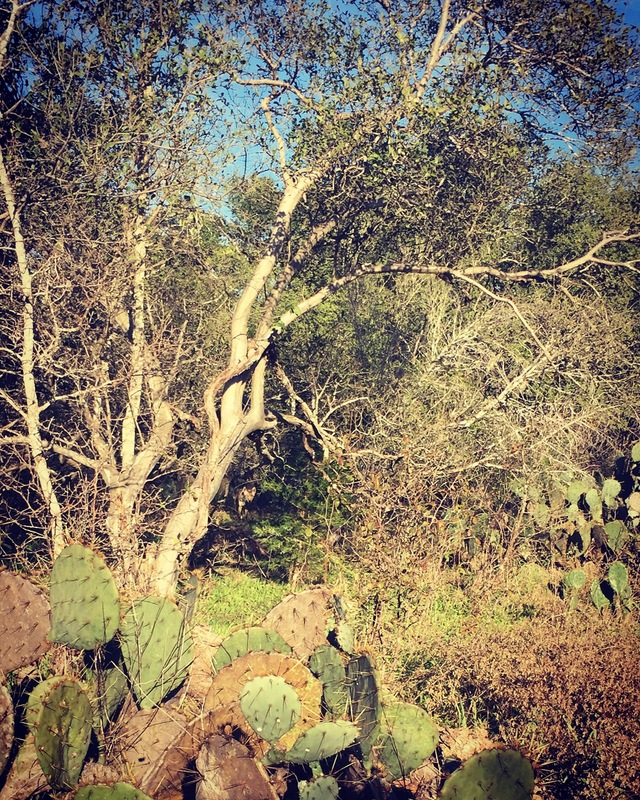 The campground is a typical Texas State Park with a decent amount of space for each site, suitable (if not new) showers, and plenty of Airstreams. We enjoyed the paved trail through the Park for a couple of runs and spotted an awfully large coyote. He was wary of us but not skittish enough to run off at first sight and I was able to get a picture. Parts of the paved trail were closed due to flooding in October and there is still enough water flowing over the falls to make wet feet inevitable for a crossing to the old McKinney homestead (which we did not do.) Onion Creek did have some large fish just taunting you to try and catch them! We will just say that we enjoyed an interesting dinner with Brian and Will at Black Star Co-Op on the North side of Austin. They have a nice beer menu and the food was good. I loved my beet salad – fresh and tasty. Lunch was at the Noble Sandwich Company (also good but my grilled sandwich was cold.) It was close to a fun quilt shop – The Cloth Pocket. 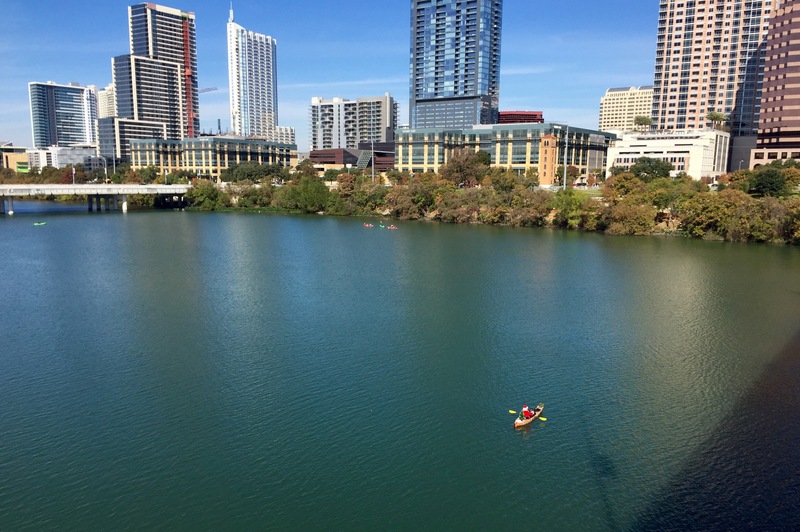 We’ve been to the Congress Street bridge twice – once for a morning walk and then to run around Lady Bird Lake (which is really more of a wide spot in the Colorado River.) Alan and I both agreed that finding a good place to run in an area is a great way to explore and get a good feel for the community. We are planning on making it a priority while we are travelling. We will be travelling in a northerly direction from here – first a stop in DFW and then a slow drive home to Pennsylvania, arriving just in time for Christmas. 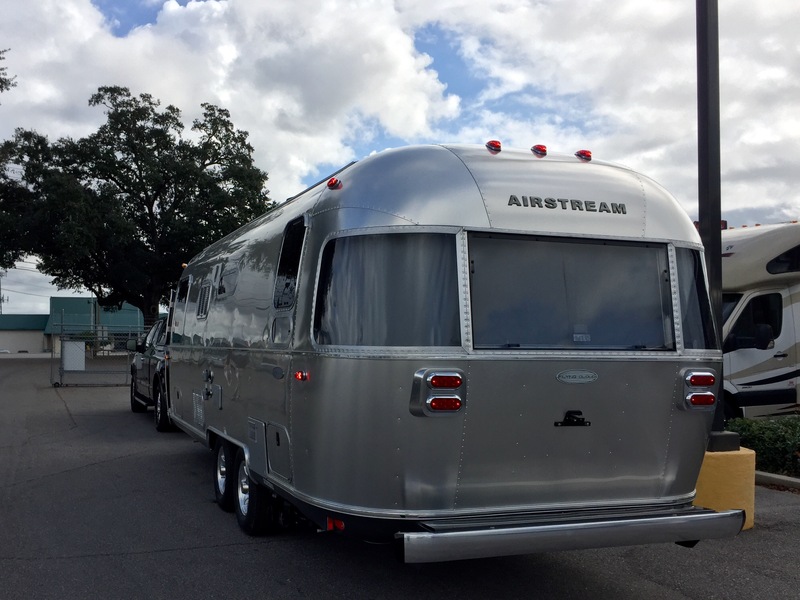 After getting back to Texas, we put our 2006 Airstream 23′ Safari into storage and later sold it to our good friends who are now enjoying their own adventures. 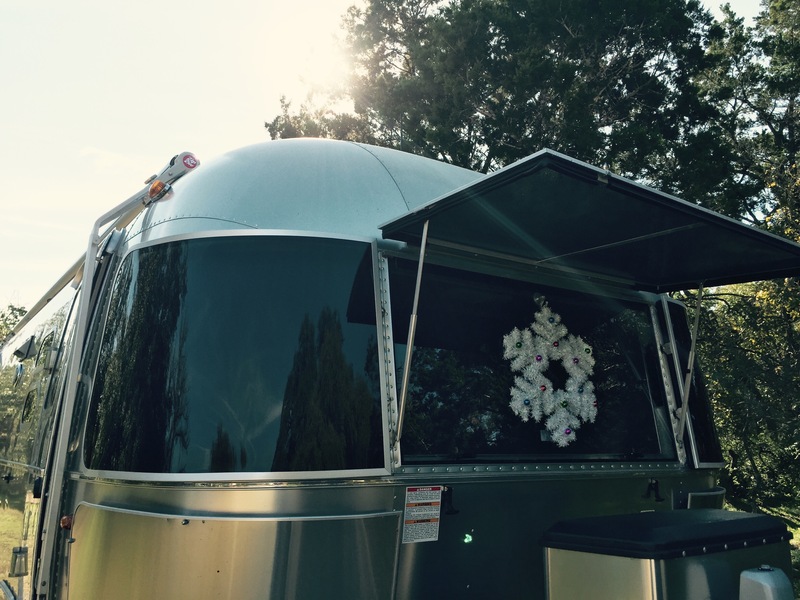 After more than a year without a trip, we’ve started A New Airstream Adventure of our own! 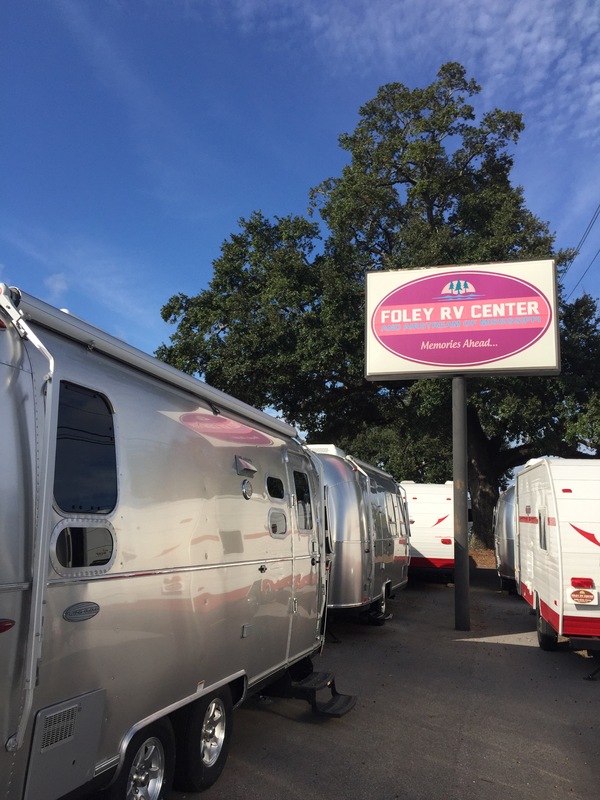 On Monday, November 30, 2015, we picked up our 2016 Airstream 25′ Flying Cloud with a queen bed in the rear and white mica countertops at Foley RV Center in Gulfport, MS.
We had a great experience at Foley and headed right out to Buccaneer State Park for a short shake-down stay. (Foley offered us the option of spending the night in their lot but we passed.) We would never stay at Buccaneer (Waveland, MS) during the peak season because this is also a waterpark and is probably a zoo with kids in the summer. It was lovely to camp right on the water but we never sat outside because of the mosquitos. I did enjoy my run along the water last night at dusk. 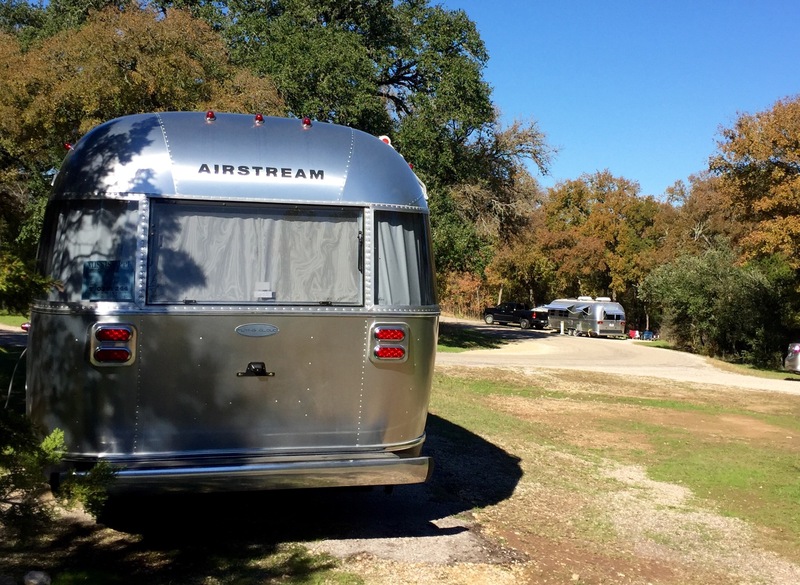 We will head towards Texas today and back to some of our favorite campgrounds that we visited with our first Airstream.